I found the above image online years ago. Check out the differences between the catalog first shot (above) and the finished product (below). 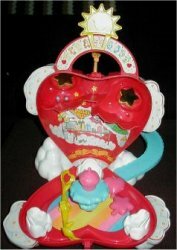 I especially love that gooey cake Birthday Bear and Tender Heart are about to devour. If you look closely you can see that the shapes are very similar but subtly different. 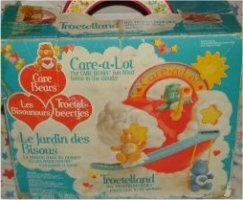 On the sides of the box it says: "Use the Look About Loft to help the CARE BEARS see if anyone needs some special "CARE BEARS" help! 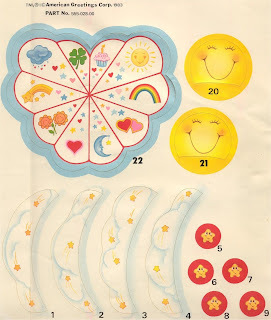 You can help the CARE BEARS have fun sliding in their cloud chairs. 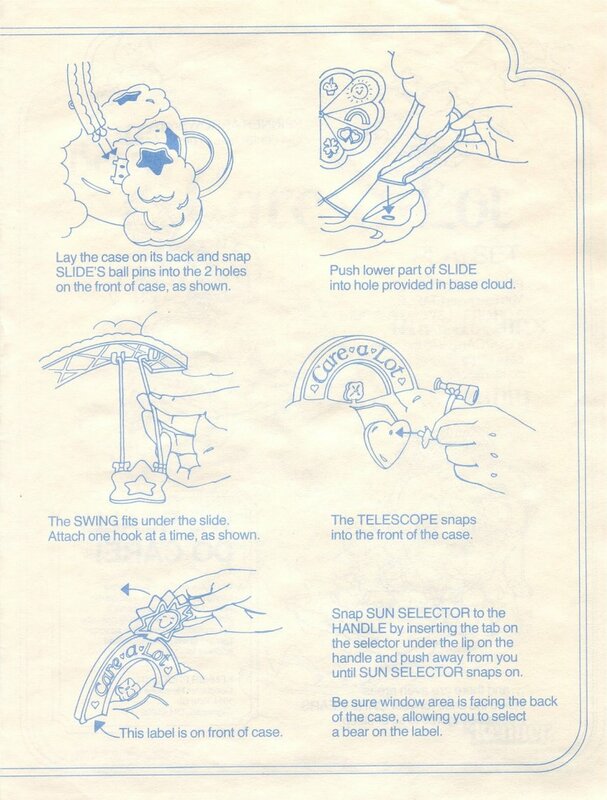 And how about a ride on the swinging star? Oops, looks like Bedtime Bear has found another place to sleep." The designer of the remarkable playset was a Kenner Employee by the name of David Winslow. 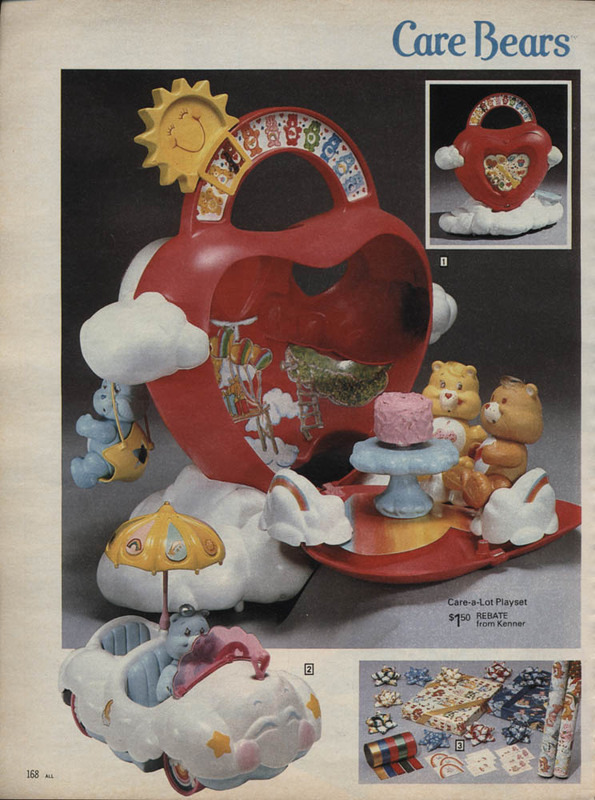 This playset was sold worldwide. 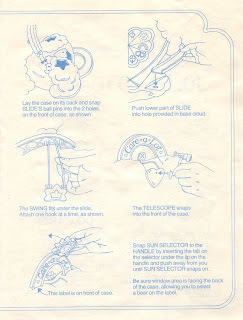 It appeared on the market with the 1st-issue poseable line in 1983 and the package remained the same throughout 1987. The European box is slightly different as you can see in the above photos. 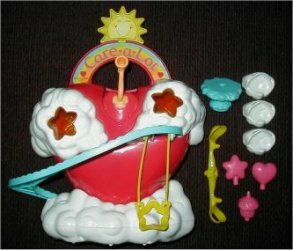 It came with the following loose and removable accessories: Blue Slide, Attachable Telescope, Attatchable Sun (Top of Playset), Blue Cloud Table, 3 Cloud Chairs, Yellow Swing, Yellow Spinner (Poseables sit on it and it spins in the center of the playset), Heart Tabletop Piece, Star Tabletop Piece, Cupcake Tabletop Piece. No poseables were included with the set. 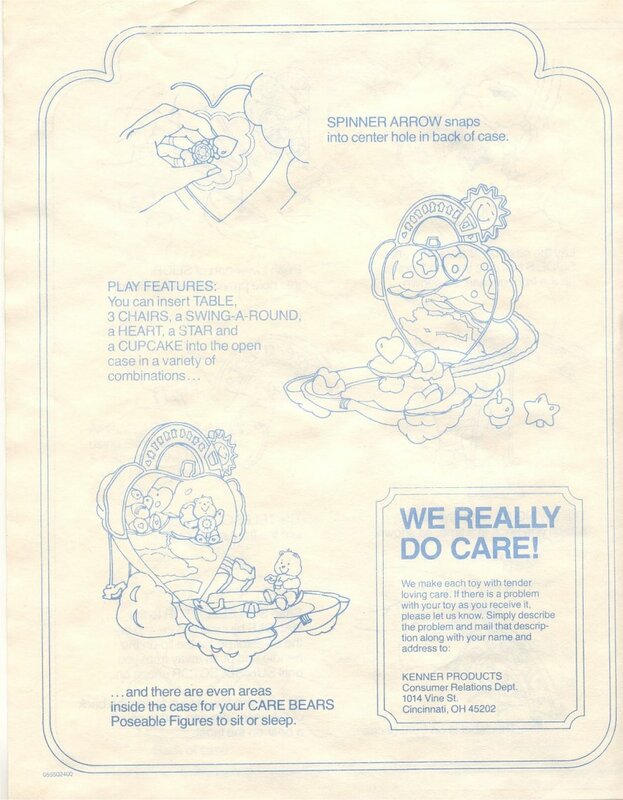 Helpful information from David Winslow: "I was a designer for Kenner in the early 1980's and developed product for Care Bears along with Strawberry Shortcake. 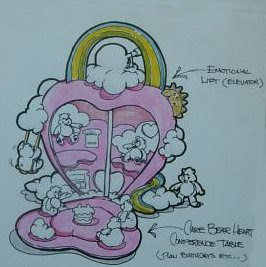 Up for auction from my personal files is the the original rendering (25 X 19 INCHES) presented to Kenner management to get the go ahead on the Care a Lot playset. 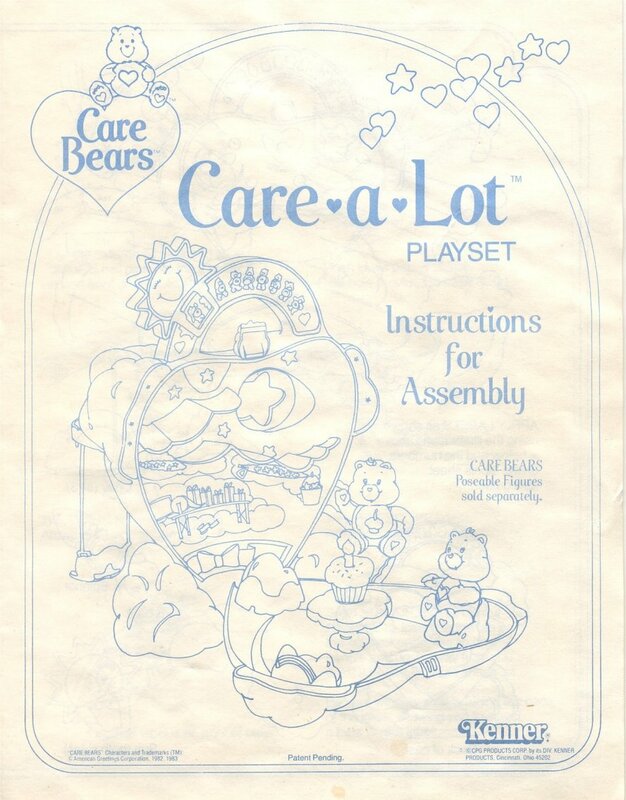 Also included is an early production sample boxed for the playset, an original Kenner inter office write up for the Care Bear line that was passed out at the meeting. 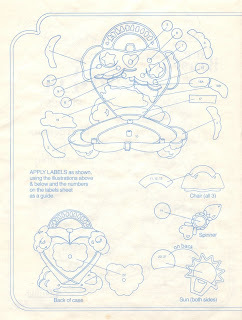 Original drawings inclued for the elevations of the playset that were used by the model maker to start creating this toy." 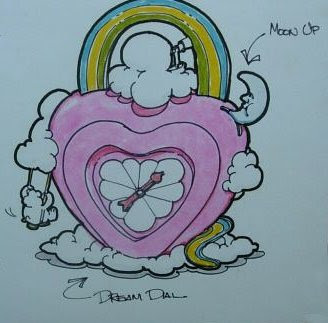 This art set was auctioned off on ebay in July of 2007. Notice the variations from the produced version, a heart window, an entrance from the back, a middle pole, sun and moon retraction, etc. Wow! That's an incredible amount of information! Thanks for pulling that all together. :) That prototype cake does look pretty tasty! Hi! Do you think you'll update ever again? You're my favorite blog and I always looked forward to your posts. Is everything okay? Great info! 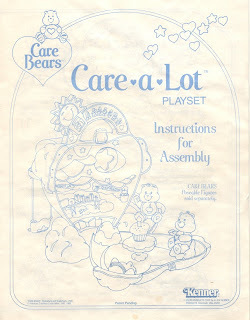 I am missing the swing on my care-a-lot play set and noticed you have a few for sale in your "for sale" section. I would like to purchase one, just let me know how I can purchase one. Thanks! 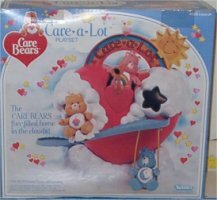 Do you have any additional information regarding care bear prototypes or how to reach people who may be selling them or have additional information regarding them? 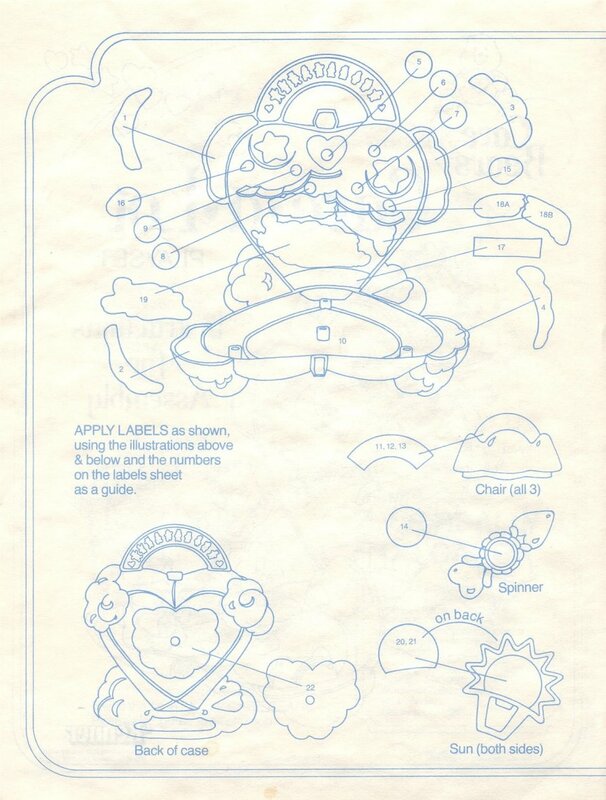 I have several plush prototypes, pictures of other prototypes, and limited information regarding a few others. I'd love to get more information and possibly add to my collection. Very cool! My sister-in-law gave my kids her oruiginal set- including the cvars and poseables. 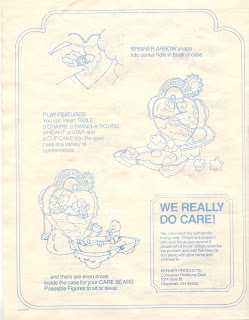 My kids enjoyed looking at this- it gae them a new apptreciation for teh toy! 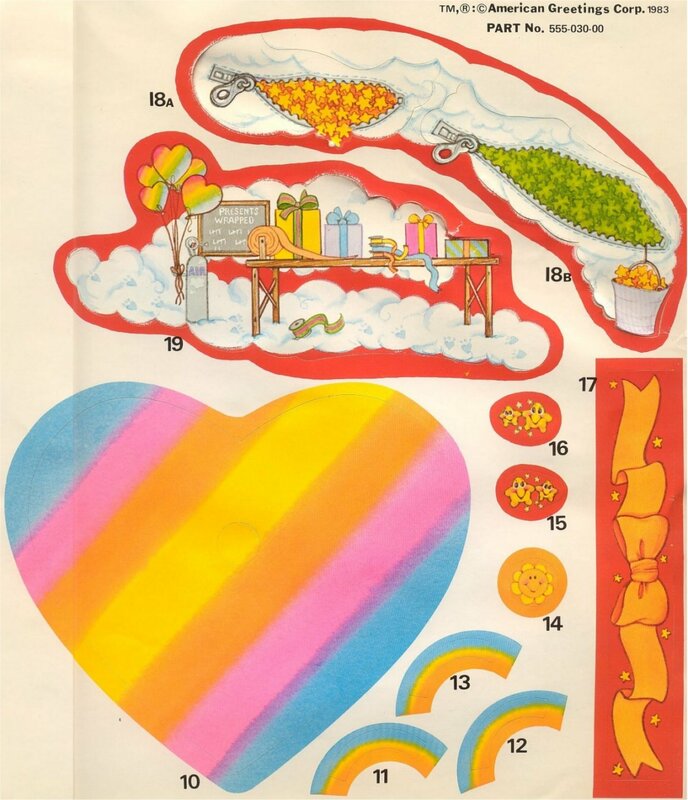 I own this art work that was auctioned off I just bought a huge vintage toy lot and this was part of the lot. 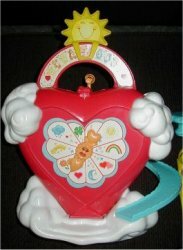 Does anyone know how much it went for or know how much it's worth?